"So what?," you might say. They can't legally force the UK government to do anything. But there is something else deeply significant happening here. Read between the lines and you can see the case being made for another referendum on Scottish independence. as well as for another Brexit vote. Today's vote was proposed by the Scottish Greens. The SNP added their own amendment which "calls on the UK government to stop ignoring the views of this parliament and overwhelming majority of people in Scotland who wish to remain in EU". In that sentence you can see how they hope to build support for independence on the back of Brexit. By telling Scottish voters they are being ignored by a government in London which does not respect their opinion or their elected representatives. I'm not trying to suggest the SNP are being entirely cynical. They sincerely believe that Brexit will significantly damage the Scottish economy and is the wrong path for the whole of the UK. They genuinely want to see a "people's vote" that could potentially reverse the result in 2016. But they know the result could mirror the 2016 referendum - with Scotland voting to remain but the UK as whole voting to leave. Voters in Scotland could be, once again, "ignored". As the Europe and External Affairs secretary Fiona Hyslop said in the Holyrood chamber today: "A second referendum is an opportunity and not a guarantee for the wishes of Scotland to be respected. "It is only by becoming an independent country that we can guarantee the votes of people in Scotland will not be ignored." The argument for independence is being quite deliberately fused with the idea that Scotland, its people and its parliament are being callously ignored by Westminster. 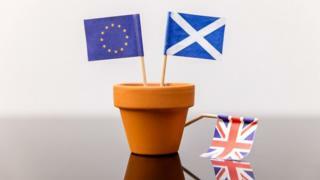 Scottish government warnings about how many jobs could be lost after any kind of Brexit have not yet produced any kind of "Brexit bounce" in opinion polls that ask people if they support Scottish independence. So might they respond better to the argument about a democratic deficit? That's clearly what the SNP hope will happen. As they argue that the views of the DUP or the ERG seem to matter far more than the 62% of Scottish voters who voted to remain in the EU. Scottish First Minister Nicola Sturgeon will not update us on her plans for another indyref until the Brexit chaos has died down. As we wait, expect to hear the arguments about Scotland being unfairly, outrageously, ignored get louder and louder. What led to Sri Lanka's Easter carnage? Could your hairstyle be causing hair loss?